Skydiving meteorite: It was a rock. (Final) Follow-Up: Yup. It Was a Rock. 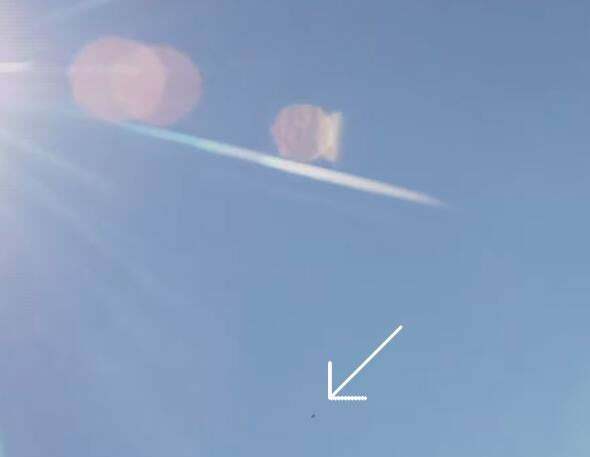 For those of you taking notes at home, over the past few days I wrote a couple of pieces about a viral video that purported to show a meteoroid (the solid part of space debris that gets hot and creates a meteor when it rams through our atmosphere) zipping past a skydiver. At first I was open to the idea, if skeptical, but upon further reading and examination I became more convinced it was just a rock that fell out of the skydiver’s parachute. Unfortunately, that turns out to be the case. It really was just a rock. Steinar Midtskogen, one of the people involved with making the video, has written a post with the story. Clearly they were hoping it was actually a meteorite, but the evidence mounted up to the more mundane, terrestrial explanation. A second bit of debris seen falling past the skydiver. This is a frame from the footage online from the skydiver’s forward-facing camera, at the 2:51 mark. The debris is highlighted. Literally a less than a second later the big chunk goes by, making it pretty clear they’re connected by the same event: the parachute unfurling. If they were both meteoroids, there is no way a smaller one would be so close to the bigger one; air resistance would have separated them by hundreds or thousands of meters by this point. The more logical and parsimonious explanation is that they came from the parachute itself, accidentally wrapped up with it when it was prepped for the jump. Thus endeth our tale. While I would have loved this to have been a real meteoroid, I’m glad this worked out the way it did: The video-makers were honest, did their level best to figure this out, and when they got as far as they could, they put it out to the public. And when it was shown to not be what they had hoped, they admitted it openly and clearly. That’s how you get to the truth, folks. Open inquiry, honest investigation, and acceptance of the line of evidence no matter where it leads. My hat’s off to the folks behind the video, and to all the people in Internet land who contributed to figuring this out. Well done.